County voters were blessed with two great men on the ballot for this office. It’s nice to have an election where you can’t go wrong. 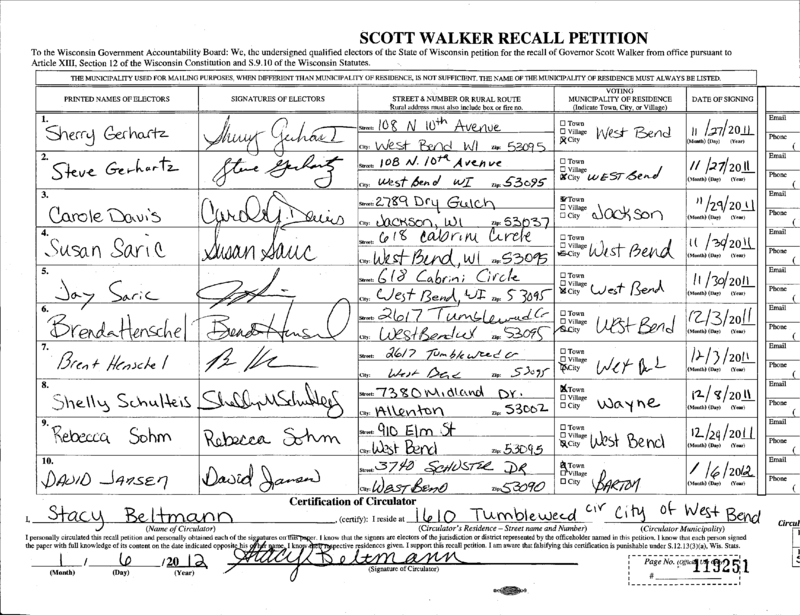 It has come to my attention that the wife of one of the two Republican candidates for Washington County Sheriff signed the petition to recall Governor Walker in 2011. Shelly Schulteis is the wife of Captain Marty Schulteis. She is a teacher in the West Bend School District and signed the recall petition. You can see it for yourself here. One can certainly debate how relevant this fact is, but it is certainly newsworthy. The attempted recall of a sitting governor over the passage of Act 10 was a defining issue in Wisconsin that energized both sides of the debate to a white hot fury. The debate over Act 10 continues to be waged even as the evidence of years has mounted to prove that the Act has been tremendously successful in liberating local governments and taxpayers from the shackles of the entrenched public employee unions. It is precisely because the attempted recall of Governor Walker was so controversial that signing the recall petition continues to be relevant in current events. In this case, we are not talking about the candidate signing the petition. We are talking about his wife. How relevant is it to how the candidate will perform the job should he win? That’s hard to say. We are also talking about a political office that, although partisan, is not terribly political. While a Sheriff can be politically active and has a philosophical view of how to do the job, 90+% of the job has to do with things like leadership, management, prioritization, communication, preparedness, etc. Also, Marty Schulteis has a long history on the job in Washington County. If he were a closet lefty who uses his position to advance liberalism, one would think that someone would have noticed by now. I haven’t heard anyone make that claim. I have met with both candidates and investigated their backgrounds. I am personally still undecided and it’s a close call for me. Both candidates have solid law enforcement bona fides and conservative philosophies, but have slightly different takes on how to be a Sheriff. You can read my column from a few weeks ago about them. This is another piece of data to throw into the decision matrix that wasn’t included in that column. I asked Captain Schulteis if he would like to comment. He provided a very thoughtful response that I have posted in full below. My commitment to Washington County is that I will be a Constitutional Sheriff that protects the individual rights of every person. The first 10 amendments to the US Constitution contain individual rights including the 1st amendment freedom of expression. My core belief in individual rights does not end when I pull into my driveway. My wife is an exceptionally talented and dedicated local elementary educator of over 20 years. She is a strong and independent woman and I love her more than life itself. We started dating in high school long before our career paths developed. She and I share common ground on many public policy issues, but there are other areas that we find ourselves on completely opposite spectrums politically. One such example is the Governor’s performance. She signed the Walker petition back in 2011 based on her convictions. She also never left the classroom during the Madison protests based on her convictions. We have simply agreed to disagree on Act 10. Anyone with a significant other can probably relate to not always agreeing with one another on some issue. I was raised in a conservative household and that is simply who I am. Although I do not agree with her, my greater conviction is that I completely protect her ability to have a difference of opinion. If elected as Sheriff, my pledge will be to represent all with respect, dedication and fairness. The Sheriff needs to embody everyone’s common concerns relating to local public safety policy. It is imperative that the Sheriff can work with others that may not have the same philosophical views, even his wife. On the eve of his third term as Washington County’s Sheriff, Dale K. Schmidt has decided to enjoy the fruits of his years of service and will retire upon the conclusion of his term in January. Sheriff Schmidt leaves behind a proud legacy of service, honor, stability and leadership. Washington County is better for his having served and we citizens of the county owe him our gratitude. Now our attention must turn to his potential successor and who will lead the sheriff’s office for the next four years or more. The Sheriff’s Office has ancient English roots and a broad mandate. In Washington County, the sheriff is the only countywide elected official and has a wide range of responsibilities. The Sheriff’s Office is the primary law enforcement agency for every part of the county that is not served by a local police department. The Sheriff’s Office also provides additional support and resources for the local police departments. The 911 dispatch center, county jail and juvenile detention facility are all run by the Sheriff’s Office. The Sheriff’s Office maintains a SWAT team, dive team, transports prisoners to and from court, provides security in the courts, runs a multi-jurisdictional drug unit, provides D.A.R.E. and other educational resources, executes foreclosures and evictions and is the primary law enforcement response unit for many of the county’s schools. It is a very busy department with diverse duties. Perhaps the most remarkable aspect of Sheriff Schmidt’s tenure has been the lack of controversy. In an era where some other law enforcement agencies are finding themselves embroiled in scandals and responding to public outrage, the Washington County Sheriff’s Office just gets the job done. Through honest, open performance with a humble respect for the rights of the citizens they serve, the sheriff’s department has earned a great deal of trust throughout the county. Meanwhile, as good stewards of the taxpayers’ money, Sheriff Schmidt’s office finished with a budget surplus of $231,500 last year. Sheriff Schmidt’s successor has big shoes to fill. But like any county, Washington County has some looming problems that the next sheriff will need to tackle. As cited in the Sheriff Office’s most recent annual report, high speed pursuits have been on the rise. Many of these occur on Interstate 41 or Highway 45, which have become high-speed conduits for criminals through the county. These chases are dangerous for everyone involved. Another rising problem is criminals raiding into the county from the south. Last year, almost 20 percent of jail bookings in the county were residents of Milwaukee. That is a 38 percent increase since 2014. This ispartially driven by the increase in the number of people who fail to appear in court every year. About 45 percent of those who fail to appear hail from Milwaukee County, requiring extra effort and time to track them down. Two candidates have stepped forward for the opportunity to be the next sheriff of Washington County. Both serve in the sheriff’s department. Both are Republicans, like Sheriff Schmidt. The primary election to select the Republican candidate is Aug. 14. Since there is not a Democrat running, whoever wins the Republican primary will be the next sheriff. The voters of the county have the privilege to choose between two qualified, conservative, honorable men. Lt. Jason Guslick has served in the Washington County Sheriff’s Office for 17 years in several roles working up through the ranks. Touting himself as a conservative Republican and lifetime NRA member, Guslick recently announced the endorsement Tim Schmidt, the president and CEO of Delta Defense in West Bend. Capt. Martin (Marty) Schulteis has served in the Washington County Sheriff’s Office for 25 years in multiple roles and has also worked his way up through the ranks. Schulteis lists his core values as fiscal responsibility, integrity and accountability, and believes that his extensive background and experience in public safety have prepared him to be the next sheriff. Schulteis lists his primary issues as combating the current drug epidemic with a multi-faceted approach. He is also looking ahead to the coming resurgence of the meth epidemic in the county. Although opioids/ heroin are the drug du jour, cheap methamphetamines are flooding in from Mexico and have already saturated other parts of Wisconsin. Since meth has a stimulant effect on the human body, it poses different challenges to law enforcement and Schulteis is focused on the issue. Schulteis will also advocate to add an additional circuit court to the county to help manage drug crimes. I encourage every voter in Washington County to take the time to get to know the two sheriff candidates before the Aug. 14 primary election. It is an important office that directly and indirectly impacts every citizen. The county has had a great sheriff for many years. Let us make the effort to ensure that the office will be in good hands for years to come. The Sheriff’s Office would like to return the below lawnmower, and chair, to the rightful owner. Investigators can only assume the items inadvertently fell out of the back of an environmentally conscious person’s vehicle as they were on their way to one of the many different types of recycling centers that accept such items. We would also hate to have the person miss out on any opportunity to get a bit of spare change at one of the several conveniently located scrap yards throughout Washington County. This could potentially offset the cost of gas it took to drive out to the Town of Wayne where it fell out of the vehicle and landed neatly in the ditch just out of plain sight. Investigators are amazed just how lucky the Town of Wayne was that the lawnmower, only by chance, landed on a cardboard box that protected the environment from the dripping oil. Investigators are also examining the physics of how that same cardboard box the person used to protect his/her own vehicle carpeting could have flown out of the vehicle at the same time as the other items. If the person would also like the cardboard box returned the Sheriff’s Office could facilitate that return. We understand it could have some sentimental value as it was a box for a pink scooter; we would hate for your child to miss it. We do not wish to set a bad example for your child by not returning something that does not belong to us.